Three and a half years after the tragedy, most of plants and materials will be burned and the ashes stored. 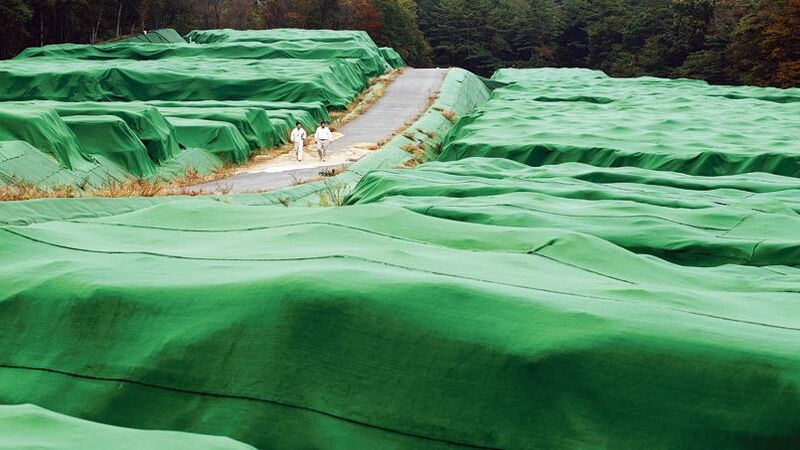 In Kawauchi, a small village located on both sides of of 20 kilometers division line around the Fukushima plant, many one cubic meter bags, are filled by the decontaminators with radioactive vegetal waste. Plants, grasses, lichens, shrubs that lined the road are now piled into these big bags. Thus, the radiation received by persons traveling on this path is reduced. The plants are also removed within 20 meters around houses. With Date and Minamisoma, Kawauchi is one of the “model villages” exemplified by the IAEA (International Atomic Energy Agency) and the Japanese government. The committed efforts are huge . In less than a year, since the nuclear accident in March 2011, projects funded by the government were already valued at 10 billion euros only for the decontamination of soils, houses and a microscopic part of the forests. At present, the kariokiba, the temporary storage sites, are overfull of waste. About 43 million cubic meters (43 million tons), as plastic bags of blue, black or gray colors depending on the choice of the town, are piling into a thousand temporary sites. The bags are half filled with plants. The Japanese government has pledged to deal with the waste from 1 January 2015. But nobody believes this possible in such a short time. “We’re late,” admits Mr Ozawa, deputy director general of the department of environmental restoration in Fukushima, under the Ministry of the Environment. As early as our first work, which started in the summer of 2012 and mobilized 17,000 people, “local authorities told us that we were too slow,” he admits. At the Otsube storage site in Kawauchi, Youichi Igari, 40, who works for decontamination, admits that the government should not be able to recover the waste in the time promised. This thorny issue of waste is closely related to the return of populations. Currently, 130,000 people are still displaced, according to the Government, out of which 50,000 out of the Fukushima Prefecture. The family of Youichi Igari family is one of those who left the town of Kawauchi. “My wife is afraid to come back,” admits the technician. Compared to our own surveys made with a Geiger counter, the measuring of the radioactivity carried by the city is minimized by a third. A difference that their expert justified by “the margin of error of measurement” … More serious over the bags covered with a green tarp, plants began to grow. Sign that the sealing is no longer guaranteed. And if in the kariokiba visited in Date the black bags seem tight, the official measurements of radioaction that people can find on the Internet are lower than our measurements. Divide by ten the number of bags could improve decontamination and encourage the return of the nuclear exiles. The Japanese government is planning to burn and store its waste on two sites in Futaba and Okuma for those highly radioactive and in Tomiaka for those weakly radioactive (8,000 Bq / kg). Three towns near the Fukushima Daiichi Nuclear Power Plant. The most active ash (100,000 Bq / kg) will be trapped in concrete and stored in an intermediate site for thirty years. Then to be moved after to a final repository to be stored there for more than two centuries and a half. For already one year the Japanese government has informed the IAEA of its intentions. “It’s good management, rather than letting the plants rot and release biogas. Burning waste is a method that we already use in France to reduce volumes. For some of the waste, the operation in France is performed at the Centraco plant near Marcoule, a subsidiary of Socodei, which packages the ash into concrete, “says Bruno Cahen, the Andra industrial director. This is particularly the case of technical waste containing cesium-137 which radioaction is halved every thirty years. “It is not possible to recover 100% of the fumes. But technology can improve the collection of emissions to limit emissions into the atmosphere, “says Didier Dall’Ava, deputy director of sanitation and nuclear decommissioning at CEA. Finally, in the case of the Japanese waste “the safety of the ashes with concrete must be confirmed from a chemical and mechanical point of view,” adds François Besnus, director of waste at the Institute for Radiological Protection and Nuclear Safety. Still, the scale of the Japanese project is extraordinary, outside the norm. The Marcoule site has the capacity to incinerate 3,000 tons of solid waste per year, it is quite low compared to 22 million tons of radioactive waste that the Japanese government wants to eliminate. Even if Japan opts for the best technique (rejection of one radionuclide in 100,000 to 1 million, according to Areva) this operation will lead to significant emissions into the atmosphere. As to incinerate waste will not remove the radioaction . Reconquérir le territoire reste une tâche titanesque. To reconquer that territory from radiation will remain a gigantic task. Vast quantities of radioactive debris from the Japanese tsunami were distributed throughout Japan and incinerated, thus releasing deadly radioisotopes around the entire country and back into the environment. That will also raise the increased risk of cancers and other chronic diseases throughout Japan as well. Incineration of the vast plant and soil materials will again accomplish the continual spread of the radioisotopes trapped in those bags. It is NOT a solution for radioactive contamination. Incineration releases radioisotopes up the stack, into the air, and back into the lungs, soil, water and future plant life, wherever it lands. The only solution is containment of these tonnes of nuclear waste. A better solution would have been to accept that a much larger area of Japan beyond the 20 km zone is and will be an evacuation zone, where no person and no vegetation should be harvested for centuries and longer! Not trees for burning or lumber for building, not plants for food, not fit for human or livestock. This kind of ‘cleanup’ is part of the propaganda, because it is NOT possible to recover land heavily contaminated. The massive expense would have been better spent on compensation to families for their land and their relocation away from this nuclear wasteland. As long as Fukushima keeps spewing contamination into the atmosphere it will contaminate a large swath of Japan and the Japanese coast. The damage to the Pacific is already becoming incalculable, as it will continue for decades… many decades. Burned and the ashes stored in the carbon cycle? So what this kills or has killed millions of birds; landed on billions of plants; that millions of animals have ingested or breath into their lungs…whose care about the wild life? Then there’s the people having all the same problem. Does EVERY country only elect genocidal maniacs? Does EVERY country have “an easy to deceive” Public? Look at the 500 nuclear plants around the Globe…. and the mess is still growing! Not a SINGLE PLANT has EVER made a single penny in profit!!! All subsidized by the Public’s money. Where’s Al Gore? The top bullsh*tter of environmentalists? There is nothing “Green” about these actions of burning radioactive contamination….where are ALL the environmental groups? I know, they are all the “controlled opposition” so, the Governments can get additional monies/taxes (i.e. the fraud carbon taxes) to fight emissions pollution! Besides that, it allows these environmental groups to get billions from the pockets of well-meaning people’s money so, these groups can build empires of useless organizations! Look at the trillions that will be spent on “clean-up” but, cleaned to what degree? How do you prove it? Fukushima is still spewing massive amounts of contamination yearly in the water and air! All this “clean-up” will be useless because, the new contamination will land where the old contamination was scraped away! Duh! Where’s the profitability of supposed “safe and economical” nuclear power? They should choke to death when they lie about the supposed greatness of Nuclear Power..
What a fantastic World of renewable power the masses could have benefited from IF, solar, wind and water was used to power the Society! But no, the elected officials who received and are receiving millions in bribes, demonize and never have supported the proper research into truly Green technologies! Politicians are the finest examples of Mankind’s biggest and most evil Fools and they are very proud of it! Their personal bank balances are their success story! Pensar en guardar cenizas con contenidos radiactivos mayores de 100.000 Bq / kg por mas de 250 años en hormigón dejado al aire libre…es de psicópatas. No mas residuos nucleares por favor. Quite a few people want to pursue this interest for health, others for their self-esteem, while intend make an aesthetic significance. packing for a trip abroad is no longer just about suntan lotion and a great book, it is all about the travel gadgets. be of an adventurous nature and try hand at real car racing as well.